Transition to cycling and enjoy the very charm of Brussels in the open air! The city of Brussels, capital to Belgium and home to 2.1 million people, grew up from a small rural settlement to an important city region in Europe. At leisure, if you wish to explore this city, rent a bike and roam around in town at cheaper rates and at free will. The majestic view of Brussels along with the scenic marvels and breath-taking sights in the cool breeze and bright sunlight definitely astounds its visitors with its incredible diversity. Its culture, as well as people, will warm your hearts as you pass them by on your rental bike. You will certainly experience the true colors of this vibrant city and cherish the memories thereafter in the times to come. Biking, biking ….. and some more biking! Biking in Brussels is such a safe, efficient and pleasant way to roam around that you will probably never commute any other way once you get the taste of it. You won’t just be having fun but you will also be saving the dear planet from pollution. The bike-friendly streets and roads encourage more and more people to adopt this healthy habit. If you are traveling through the short distances then there is nothing better for you than a rental bike. Bike rental system in Brussels is an advanced one with thousands of bike rental points scattered all across the city. So it won’t be an issue for you while renting one even if you are new here. Large fleet of different types of bikes is available in Brussels, like those of city bikes, folding bikes, electric ones and special bikes which can easily be rented out and can act as an ideal fit for your journey through what they call as Alpha Global city. As the World Health Organisation recommends 30 minutes of exercise each day for a healthy living, so why not indulge in something that would be fun as well as healthy at the same time. Rent a bike and paddle along to witness the scenic waterways and picturesque buildings of Bruges and wander along the medieval streets to discover religious buildings and historical sites. Get access to Atomium, an unavoidable iconic marvel of Brussels that presents the sight of a unique creation in the history of architecture. This most popular tourist attraction in Europe’s capital city is a living place of an emblematic vestige of the world’s fair in Brussels, which demands to be explored at your own pace. And at the foot of very this place is Mini-Europe, yes that’s right, a miniature park, that represents some 80 cities and 350 buildings. This place receives more than 350,000 visitors per year and has a turnover of 4 million Euros, so why not you be one among them on your cool two-wheeler ride? 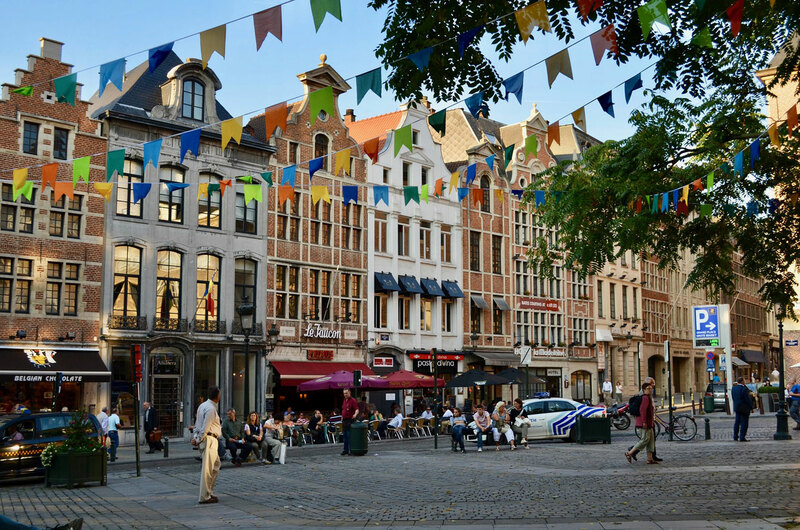 While you explore the different parts of Brussels you must also know that the Brussels preserves its rich history in around 80 museums across the capital. Among the many famed is the renowned Magritte Museum, known for housing the world’s largest collection of works of the surrealist René Magritte, who was a famous Belgian surrealist artist. So you will be delighted to stop by and have some photographs clicked for showing it to your friends and family while you are back in your home station. Also while you are out exploring museums then why not witness one that is loved by one and all. If you want to learn more about chocolates and are wondering how it evolved and transformed? Then do so in the Choco-Story Brussels museum, explore the culture of cocoa, enjoy the tastings and see a live demonstration of them by world-renowned chocolatiers. No wonder the Brussels’ International Airport is the world’s largest chocolate selling point. Fun Fact: Brussels also has a Fries museum! Yep! That’s right. Relish the city’s tasty street food! So in a city which has museums for chocolates and fries, there is no chance you can avoid the savory street food while you are already burning your calories. Stop by to taste the delicious Belgian fries or treat yourself to the Smoutebollen, deliciously deep-fried dough much like a doughnut and even eat the Caricoles, which are sea snails, boiled in broth with vegetables. And the list goes on. So treat yourself with some of the delicious foods of this beautiful city while you are on your rental bike exploring the city all along. If you are visiting the economic capital of Belgium for the first time and want to explore the financial center of Europe on a rental bike or if you have been here all your life but still want to hop on the bandwagon of biking culture then do so with all your heart, rent a bike and treat your eyes with some of the world’s greatest marvels at this very place.